Hello Friends ……..Recently a tiny bug in the Linux USB Device Driver had crashed my kernel , Its very common that bugs in the Device Drivers written brings down the system by crashing the kernel.The reason being that unlike the usual programs we write Drivers run in kernel space.When programs run in user space and when we commit common programming snags like segmentation faults or any invalid memory reference the kernel handles it to maintain the system stability , but in case of drivers which run in kernel space there is no one to monitor since the kernel forms the core of the OS hierarchy . Because of the above reasons its not safe to code in kernel space and better not unless there are no alternative ways to achieve the purpose.In driver writing , A simple unnoticed bug in a line of code could compromise the whole system. Recently i came across a open source project by name LIBUSB . At first glance i assumed LIBUSB to be not so handy library to use and program with , but when i realized that using LIBUSB Linux USB Drivers can be written completely from user space i was amused to start using it to write USB Device Drivers under LINUX. 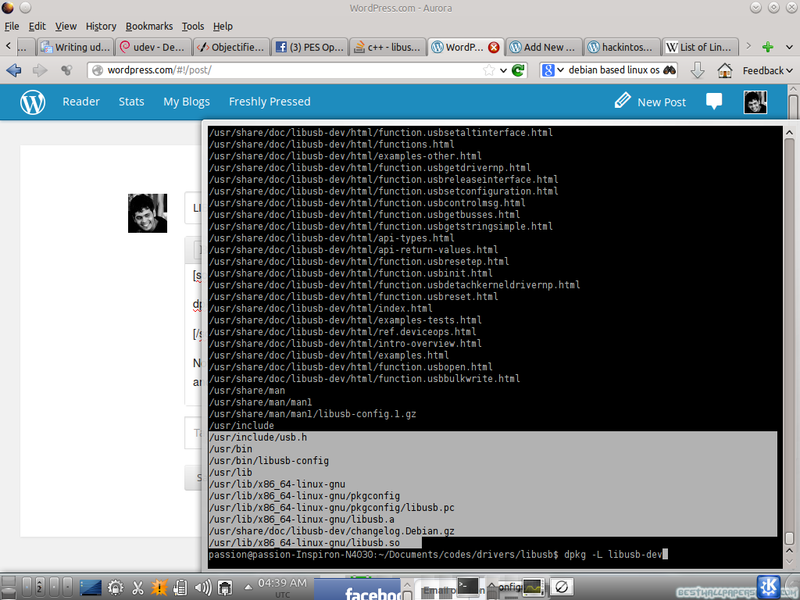 we’ll the first of installing the LIBUSB library is over , now i wrote my HELLO WORLD libusb driver . During compiling the code using gcc/g++ the LIBUSB library had to be linked by using -L option . But i couldnt find the libusb libraries under /usr/lib where usually all the libraries reside.All the online resources i referred stated the libraries to reside in /usr/lib . Later i found out that the path where LIBUSB libraries (.a) and headers and their names differ with few versions of LIBUSB . So the best way out was to search where the current LIBUSB package installed its headers and library. Now focus on the last few lines of the output and find the path where the library libusb.a and the header file usb.h/libusb.h is installed. Now make sure that you add the header name in the code and , during compilation just add the parent directory of libusb.so along with the -L option of gcc/g++ .Also dont miss to add -lusb option during compilation.